While the South China Sea has been a disputed region for decades, the intensity and relevance of the matter have increased in the past few years. 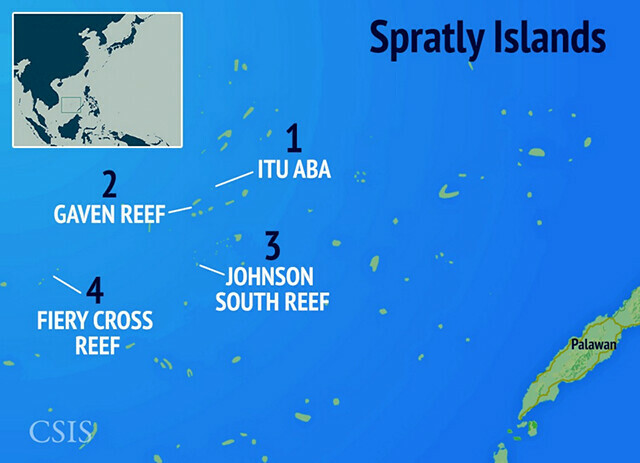 The severity of the situation became apparent on April 8th, 2015, when China transformed Mischief Reef into an artificial island. According to the United Nations Convention on the Law of the Sea (UNCLOS), sovereignty over islands allows countries 12-nautical mile radii of territorial waters for economic and political use. While China’s artificial island building campaign has been rejected by the international community, it allows China to claim the South China Sea for economic and political use. In 2016, China alarmed the rest of the world when it began militarizing its artificial islands in the South China Sea. Satellite images of Fiery Cross Reef showed fuel bunkers, warplane runways, and aerial radars on an island that was previously only a small fraction of its current size. Such measures drew attention to the very real possibility of an Air Defense Identification Zone (ADIZ) being set up over the entire South China Sea. This would essentially allow China to arbitrarily regulate air traffic in the area and undermine freedom of navigation. China’s island building campaign continues today, accompanied by clashes with other claimants in the region and a consistent rejection of international criticisms. In July 2016, the Permanent Court of Arbitration (PCA), an international legal tribunal, rejected China’s “9-Dash Line” which defined its historical claims over the South China Sea. The PCA deemed China’s actions illegal and also ruled in favor of the Philippines in its contest over territorial claims with China. China immediately rejected the ruling and the many skirmishes that have occurred since exemplify the current situation faced by all actors in the South China Sea. As the only country in the world capable of countering China’s regional assertiveness, the United States, primarily through the Navy, has endeavored to uphold the principle of freedom of navigation, prevent China from successfully claiming the South China Sea as its own territorial waters, and deter military conflicts in the region. So far, this has been mainly achieved by displaying naval power by sailing destroyers through the area. On October 27, 2015, the USS Lassen traveled within 12 nautical miles of land masses built by China in the Spratly Islands, an act which became the first of multiple “freedom of navigation operations.” In addition to strengthening bilateral ties with countries in the region such as Vietnam, the US has also conducted joint patrols and exercises as shows of force. A. January – The USS Antietam runs aground while trying to anchor in Tokyo Bay, Japan. B. May – The USS Lake Champlain is struck by a South Korean fishing boat while conducting operations near the Korean Peninsula. C. June – The USS Fitzgerald collides with a container vessel off the coast of Japan, resulting in seven US sailors dying. D. August – The USS John S. McCain collides with an oil tanker off the eastern coast of Singapore, resulting in 10 US sailors dying. The tragic nature of such events can never be overstated, and the priorities of any armed forces should be the safety and well-being of its personnel. Having said that, the sheer frequency of naval incidents in such a short period of time shines an unwarranted light on the US Navy when it needs to project strength and robustness. Since the end of WWII, the US has routinely stabilized international relations through the credible projection of military force, often eliciting the approval and regard of regional powers everywhere, however, recent events off the coast of China are gradually undermining this strategy. At the most basic level, naval accidents threaten to derail the confidence US sailors and commanders have in their own navy. For a ship crew to lose comrades to a peacetime accident is a tragic experience that saps morale. The impact of these accidents is even more pronounced on the domestic front, especially in light of ongoing movements to further reduce the US military’s budget. If the US seeks to continue its operations in the South China Sea, it needs to rein in these blunders before they begin to shake public confidence. The issue of credibility is equally salient regarding the international community. After the USS John S. McCain incident, a Chinese run newspaper reported that “U.S. warships are constantly involved in accidents around the South China Sea…on the one hand, the U.S. Navy has behaved arrogantly in the Asia-Pacific region. It lacks respect for huge merchant ships and fails to take evasive action in time, thus resulting in serious accidents.” While such statements might be expected from America’s main rival, they emphasize the escalating geopolitical contest between the two powers. If the US is to retain the good regard and trust of its regional partners as it ensures freedom of navigation in the South China Sea, it must shore up its military competence, something that is being undermined by the recent series of incidents. While it may be tempting to shrug off China’s disapproving comments regarding the USN’s accidents, China’s input is crucial in resolving the conflict. Recent accidents suggest a lack of willpower and discipline in addition to sub-par training. The effectiveness of America’s strategy of deterrence depends directly on its military credibility and capability, and if China perceives America to be losing its military preeminence, it will certainly be tempted to escalate its regional assertiveness. Whether this takes the form of aggressively militarizing its islands or outright confrontation with US ships may very well depend on how quickly the US puts an end to its recent errors. To preserve its credibility and effectiveness in the South China Sea, the US must reform its navy’s operational procedures in the short-run and try to secure an increased operational budget in the long-run. Chief of Naval Operations Admiral Richardson ordered an operational pause across the entire Navy immediately after the USS John S. McCain collided with a container vessel off the eastern coast of Singapore. Halting operations like this is extremely rare and was ordered as a safety stand-down, according to a defense official. This is certainly a step in the right direction; however, reforming and overhauling the Navy must continue beyond this safety measure. So far, US leaders have only provided a short-term fix. The US Navy needs to form multiple long-term review committees, amend its organizational ideology, and possibly alter its operational doctrines, all of which can only happen over the medium to long-term. Securing sufficient funding is also crucial. 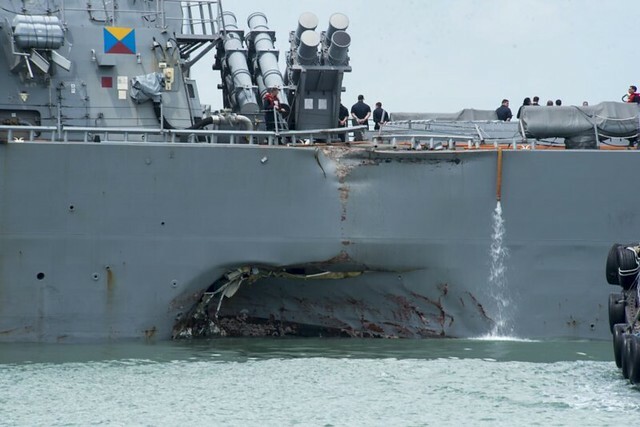 An underlying cause of the recent accidents is an under-training of personnel, under-manning of crews, and a lack of platform upgrades on naval ships. Specifically, “72 percent of the Navy’s maintenance was not completed on time between 2011 to 2014, with key ships such as the aircraft carrier USS George H. W. Bush delayed for months.” This was a direct result of the 2011 Budget Control Act, which essentially enforced a limit on defense spending. Other effects of the now discontinued sequestration, such as longer deployment periods, have also impaired America’s ability to project power abroad. As one of its highest spending departments, the US Military was an easy target for budget cuts. At some point though, it is vital to recognize that this can jeopardize the safety and well-being of our servicemen and women. At the very least, the US Congress must repeal the Budget Control Act, if not for the operational effectiveness of the US Military then for the lives of its servicemen and women.